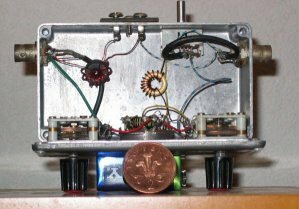 This ATU was designed in about 1990 to allow QRP rigs to be used with portable antennas. The unit had to be small and light weight. Generally I am against using ATU's at all regarding them as a cop-out for poor antenna design. However, when portable operation is considered, it is not always possible to erect the ideal antenna. 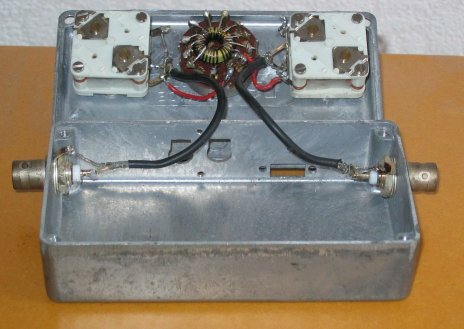 This ATU was designed with idea of achieving a better match to an antenna that was nearly right. 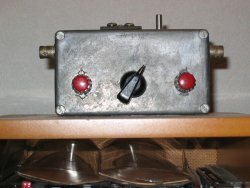 A later version was tried which had an additional coil switched in and also a balun to accomodate twin feeder. I was never happy with this version, as it didn't seem to work as well as the simple version. When it was deconstructed in 2007 to do some loss measurements, it was discovered that a constructional error during the mod may account for this. The circuit is a simple Pi circuit. The layout was arrived at when it was realized that a T-50-6 toroid would just fit inside the ring of connecting lugs on a standard 12 way rotary switch.